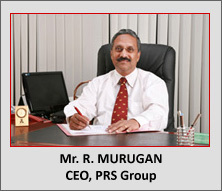 Mr. R. Murugan - Chairman, PRS Group after graduating in Civil Engineering from the College of Engineering, Trivandrum, began his professional career by joining his illustrious father P.Ratnaswamy in construction. He has more than 35 years of experience in the field of construction and real estate development. Under his management, he introduced international quality standards and processes in construction activities. With his guidance, we have also documented processes and methodologies that ensure each activity of construction and development as per the standards of quality that we have set for ourselves and ensure uniformity in our products. He is actively involved in the day today operations and activities of our company. Being an active member of the Lions, he became the District Governor of District 324 E1 in the year 2004-05. He is deeply involved in many social, cultural and professional organizations in Kerala and India and is the Vice President of Alumni Association of CET. He is a Fellow of the Institution of Engineers ( India ) and was the National Vice President of Builders Association of India in 1996-97. The Chamber of Commerce, Trivandrum awarded him the best builder award for the year 2009. 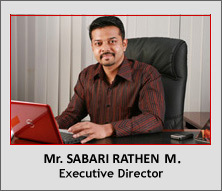 Mr. Sabari Rathen M. - Executive Director is a post graduate in Structural Engineering from College of Engineering, Trivandrum. He has over 5 years of experience in Construction and Real Estate Industry and 2 years of experience as Design Engineer in the R&D wing of Larsen & Toubro Ltd, Chennai. The knowledge gained through his valuable years of experience has been a contributory factor for implementing innovative technology in all sectors of the organisation. Mr. Rathen is responsible for design and construction activities of PRS ensuring quality and on time delivery of the projects. He is also involved in the day to day activities of PRS College of Engineering & Technology, Swagath Holiday Resort and PRS Hospital . He is resolute in creating long term relationships with the clients by delivering top class services and in constant technology updation for a successful business career. PRS BUILDERS's success stems from the professionalism and enterprise of its resources. The company's high quality standards ensure that only the brightest talent capable of extending the value experience for its customers is retained across all its functions. From a management that's busy, envisioning landmark gated communities to a design team that's diligently focused on packing quality and luxury into every square foot of construction, quality is truly a way of life at PRS.